Tungsten is a dull silver-colored metal with the highest melting point of any pure metal. Also known as Wolfram, from which the element takes its symbol, W, tungsten is more resistant to fracturing than diamond and is much harder than steel. It is the refractory metal's unique properties - its strength and ability to withstand high temperatures - that make it ideal for many commercial and industrial applications. Tungsten is primarily extracted from two types of minerals, wolframite, and scheelite. However, tungsten recycling also accounts for about 30% of the global supply. China is the world's largest producer of the metal, providing over 80% of the world supply. 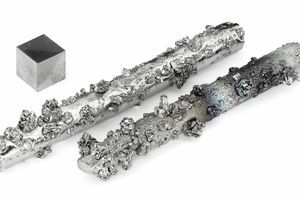 Due to tungsten's ability to keep its shape at high temperatures, tungsten filaments are now also used in a variety of household applications, including lamps, floodlights, heating elements in electrical furnaces, microwave ovens, x-ray tubes and cathode-ray tubes (CRTs) in computer monitors and television sets. The metal's tolerance to intense heat also makes it ideal for thermocouples and electrical contacts in electric arc furnaces and welding equipment. Applications that require a concentrated mass, or weight, such as counterweights, fishing sinkers, and darts often use tungsten because of its density. Tungsten carbide is produced either by bonding one tungsten atom with a single carbon atom (represented by the chemical symbol WC) or two tungsten atoms with a single carbon atom (W2C). It is done by heating tungsten powder with carbon at temperatures of 2550°F to 2900°F (1400°C to 1600°C) in a stream of hydrogen gas. According to Moh's hardness scale (a measure of one material's ability to scratch another), tungsten carbide has a hardness of 9.5, only slightly lower than diamond. For this reason, this hard compound is sintered, a process that requires pressing and heating the powder form at high temperatures, to make products used in machining and cutting. The result is materials that can operate in conditions of high temperature and stress, such as drill bits, lathe tools, milling cutters and armor piercing ammunition. Cemented carbide is produced using a combination of tungsten carbide and cobalt powder, and is used to manufacture wear-resistant tools, such as those used in the mining industry. The tunnel-boring machine that was used to dig the Channel Tunnel linking Britain to Europe was, in fact, outfitted with almost 100 cemented carbide tips. Tungsten metal can be combined with other metals to increase their strength and resistance to wear and corrosion. Steel alloys often contain tungsten for these beneficial properties. Many high-speed steels -- those used in cutting and machining tools like saw blades -- contain around 18 percent tungsten. Tungsten-steel alloys are also used in the production of rocket engine nozzles, which must have high heat resistant properties. Other tungsten alloys include Stellite (cobalt, chromium, and tungsten), which is used in bearing and pistons due to its durability and resistance to wear, and Hevimet, which is made by sintering a tungsten alloy powder and is used in ammunition, dart barrels, and golf clubs. Superalloys made of cobalt, iron or nickel, along with tungsten, can be used to produce turbine blades for aircraft.